Happy Tea Party and Tea Time Tuesday! This past week and weekend was so wonderful for me..my mom came for a visit and it was absolutely wonderful. My mom has taught me much of what I know and love about antiques and entertaining. We both love anything vintage and the art of taking tea. This weekend she shared some wonderful memories and we made some new ones! I LOVE YOU MOM! As I said last week, I began a journey to educate myself regarding the art and history of tea as well as tea etiquette. 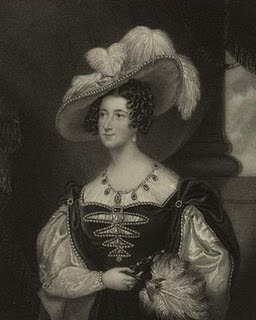 My travels into into tea history this week took me back to the Victorian era where I was introduced to a lovely lady by the name of Anna Duchess of Bedford. It is no surprise that we quickly became friends! 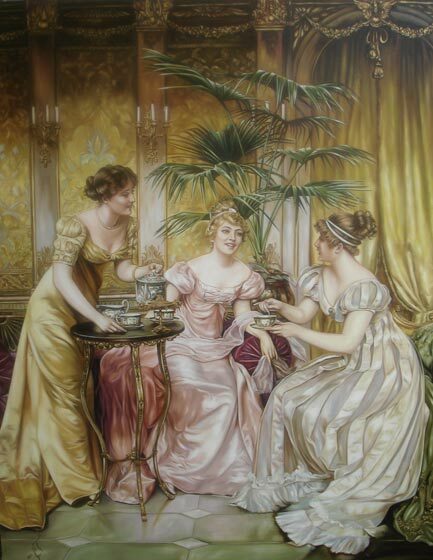 Afternoon tea was "created" by Anna Duchess of Bedford (1783-1857), one of Queen Victoria's ladies-in-waiting. During this time, the noble classes ate large breakfasts, small lunches and late suppers. Every afternoon, Anna experienced what she referred to as a "sinking feeling," so she requested that her servants bring her tea and petite-sized cakes to her boudoir. Adopting the European tea service format, she invited friends to join her for an additional afternoon meal at four o'clock in her rooms at Belvoir Castle. The menu centered around small cakes, bread and butter sandwiches, assorted sweets, and, of course, tea. This summer practice proved so popular, the Duchess continued it when she returned to London, sending cards to her friends asking them to join her for "tea and a 'walking the fields'." (London at that time still contained large open meadows within the city.) The practice of inviting friends to come for tea in the afternoon was quickly picked up by other social hostesses. A common pattern of service soon merged. The first pot of tea was made in the kitchen and carried to the lady of the house who waited with her invited guests, surrounded by fine porcelain from China. The first pot was warmed by the hostess from a second pot (usually silver) that was kept heated over a small flame. Food and tea was then passed among the guests, the main purpose of the visiting being conversation. The "high" in high tea does not imply that fancy, upper class, or expensive foods are served (or that high tea is enjoyed only by the well-to-do). It actually refers to afternoon tea served on a dining room table (a high table) as opposed to afternoon tea served on a "tea table" (a low table). High tea is a fairly substantial meal - equivalent to supper - served in working class homes. It is generally served at 5:00 or 6:00 p.m., and features a hot dish, hefty sandwiches, scones, heavy cakes, biscuits - and, of course, plenty of tea. Anna was a lifelong friend of Queen Victoria and served for a number of years as Lady of the Bedchamber. Anna's brother, Viscount Petersham, was a great connoisseur of tea. His sitting room contained "canisters of tea in great variety." It was said to look like a tea shop. *Some information obtained from Uniquely Tea Blog (which no longer publishes posts, sadly), Eras of Elegance and Victorian Revival by Cameron Freeman. When having tea with a Duchess, I wanted to serve something fancy and unique. It was very hot where I live this week so I was inspired to make a lovely Champagne Sorbet. For added fancy flair, you may opt to serve your sorbet in a frozen edible flower bowl. Either is just delightful!! The teacup was purchased this week while shopping with my mother. I have been dreaming on purchasing an aqua teacup recently and so I made my dream a reality and for TEN DOLLARS, I think it was a STEAL! The sorbet was absolutely heavenly!! To be honest I have had my electric ice cream maker for over a year and had been a bit intimidated to use it for fear of failure. The Duchess gave me the courage to take it out and make something memorable and wonderful! My mom and I enjoyed quite a bit of the sorbet!! OooooLaLa!! Anything with Champagne is wonderful! For a printable recipe for Champagne Sorbet click HERE! For instructions on how to make your own frozen flower bowl click HERE. A link can also be found on my recipes page! I am excited to see what YOU made this week for tea with Anna Duchess of Bedford! Please include a link back here in your post and if possible visit some of the other blogs that have linked up to the party! Lovely history lesson, exquisite sorbet and beautiful tea cup and saucer. Just a darling post! I love your new tea cup. It is so gorgeous! That sorbet looks so nummy. Thanks for the history lesson. My daughter has recently started drinking tea (a lot of it) and I will be telling her to pop over to learn more. Have a great week Trisha! I love your tea cup. Aqua is one of my favourite colours so, yes, I'm lovin it! I enjoy serving dessert in a tea cup too. I've done that many times. Lovely post and scrumptious too. Thanks for sharing and joining me for Tea Time. Hope you have a delightful week. It was hot here too! This looks so refreshing! Especially in your new aqua teacup! Oh my goodness!! That frozen bowl is so pretty! Don't you wish we could go back in time and have tea with the Duchess? what a wonderful post with lots of interesting informations. I really love the story of the Duchess. Your sorbet in the cup looks really beautiful and like a wonderful refreshment. The edible bowl is cute, but I guess a lot of work. Thank you for having me for this sophisticated tea. Great post. Very informative! Thank you... I'll have a dish of that sorbet now. :) It looks so refreshing. I am really enjoying your tea party lessons! In making cupcakes this weekend, I thought these would be perfect for a tea party! I need to begin my search for a tea set for my daughters and I. Tea parties look like such fun! Wonderful tea history! Sounds like a wonderful day with you Mom. Thanks for the recipes and Happy Tea Day! I just love history so I really enjoyed this informative post! Thank you so much for all the information on tea-wonderful! Very interesting post - lots to learn about tea. The champagne sorbet looks lovely! The history of afternoon tea is so interesting and a nice tradition for us to carry on. Your home made bowl is rather nice and I've wondered about an ice cream maker myself at times. Your closeness to your mother and having the same interests is remarkable. Sadly, my mother and I were never close and I like to hear of relationships like yours. You have another beautiful post. Great information and beautiful pictures. You found a lovely cup and it's so nice that you made new memories with your mom. I added your link to my Wordless Wednesday post to be able to share it here too and I also brought my Cherry Mousse. Your teacups are beautiful and the sorbet looks wonderful. Thanks for hosting today. Hi Trish, What a lovely tea cup!! I ADORe it! 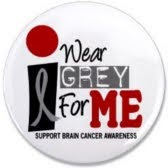 I gave one of a similar color to my mom..and have been missing it ever since..LoL! Funny, we both went shopping with our moms and ended up with new tea cups on the same weekend. ps. I want to try that sorbet! Good for you! We all love Anna the Duchess of Bedford - what a fun post! Love this story! Fascinating how simply things start and become something beautiful! You are so very creative - love your dessert! Trisha- Your aqua cup and saucer is gorgeous and what a great bargain! I have to try the ice bowls. I've made ice rings for punch should be similar. I love that you and your Mom are close and able to share so many common intersts. My Mom and I were like that. Wanted to thank you for joining in for Bunday Monday ... I loved the bunny cupcakes ...tutu cute! If you have anything else to show please do ... it will give you another chance to win .. or just make a comment for another entry! I posted the prizes Monday. There is a book I have on tea rooms in America and the effect they had on women socially and in the workplace ... Ineed to track it down and give you the name of it, I think you'd enjoy it. I love your new teacup - it is beautiful! Thank you for sharing such a lovely post and a great tea-time history! And I adore your new aqua teacup. Yes, $10 was definitely a steal for such a fetching piece! The name of the book is Tea at the Blue Lantern Inn by Jan Whitaker ... a very good read. I know I'll love this, I just printed recipes. Such a sweet post! Thank for your directing me to your blog, I'm a follower now! Lovely! Thank you for sharing this post with A Return to Loveliness! I am so glad you came by Home Sweet Home! I haven't done a tea party in a few weeks but, I am doing one Tuesday and I will come and join you! Your post was most interesting. I enjoy hearing anything about Queen Victoria and her consorts, especially how they made history. You have a great tea blog and I love to join the Tuesday tea party crowd quite often. So I'll be by soon. Thanks for linking this up to Home Sweet Home! Please put a link back to the party in your post. Thanks! Beautiful pics! I will take mine in the edible flower bowl! Beautiful photographs, and I enjoyed reading about the Duchess of Bedford. The champagne sorbet sounds wonderful too. Thank you for sharing this post with Let's Do Brunch. Hope to 'see' you there again this week.